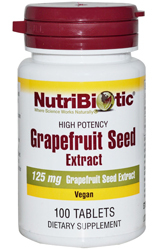 NutriBiotic® Grapefruit Seed Extract Tablets tablets contain CITRICIDAL, which is a natural quaternary compound taken from the seed and pulp of certified organically grown grapefruit. The process converts the grapefruit bioflavanoids (polyphenolics) into an extremely potent compound that has been proven highly effective in numerous applications. Even though NutriBiotic® is so potent, extensive testing done at independent laboratories and universities around the world has proven the concentrate to be safe for either short-term or long-term internal use. This formulation is used by healthcare professionals worldwide as nutritional support for maintaining a healthy bladder. The tablets are easy to swallow and this eliminates the problem of bitter or unpleasant taste. Ingredients: Grapefruit Seed Extract (GSE) 125 mg, rice protein fiber, vegetable cellulose (binder), vegetable stearine (lubricant), guar gum, vegetable coating. Contains no soy, milk, egg, yeast, wheat, sweeteners or preservatives. Completely vegetarian. Suggested Use: One tablet one to three times daily, with or without meals. Not recommended for children under 6 years of age.